Almost anything can fit between two slices of bread. And The Encyclopedia of Sandwiches by Susan Russo leaves no ingredient in the cupboard. Everything from classic combos like the Chicken Salad Sandwich to the more quirky All-In-One Breakfast Sandwich, to the sweet, such as the Ice Cream Sandwich, are included. The encyclopedia format lends itself perfectly to a sandwich cookbook–the ingredient index at the beginning lets us be inspired by whatever is lurking in the back of the fridge. Every sandwich is celebrated with a full-page color photograph and a blurb of its history. But the best part of The Encyclopedia of Sandwiches is the playfulness of the recipes. One is encouraged to “Mix ‘n’ Match” different ingredients (think almond butter instead of peanut) and many sandwiches have different variations listed. For the more experienced sandwich connoisseurs, the “Homemade Ingredients” pages take your sandwiches to the next dimension with easy instructions to make sandwich ingredients like pulled pork or falafel. 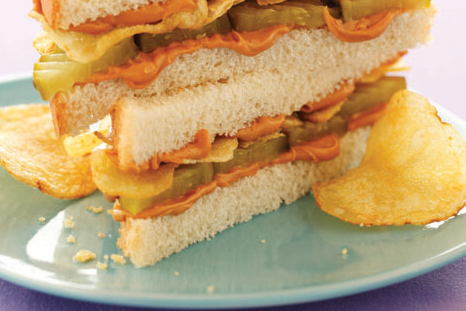 One sandwich that caught my attention was the Potato Chip Sandwich, an intriguing combination of peanut butter, pickles, and potato chips. The variation, “Cheese ‘n’ Chips” is deemed the best midnight snack ever by Russo. Below is the recipe for the Potato Chip Sandwich, but for the “Cheese ‘n’ Chips” you’ll have to buy the book! 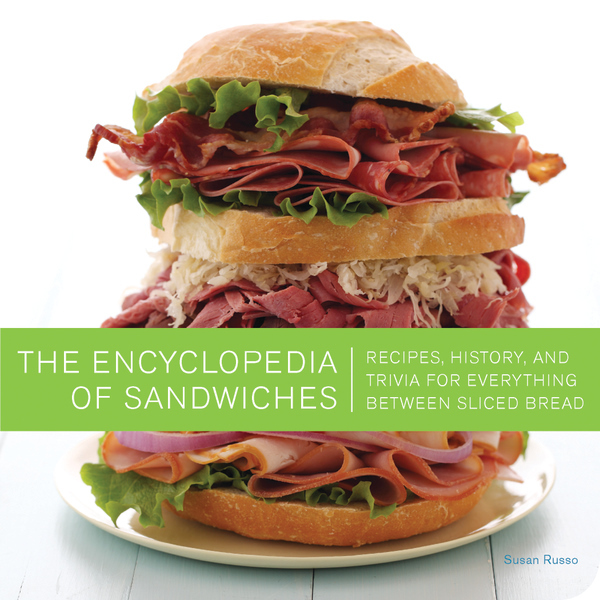 For a chance to win a copy of Susan Russo’s Encyclopedia of Sandwiches, become a fan on Facebook and comment on our post over there! The winner will be announced Tuesday! Spread peanut butter on both bread slices. Place pickle chips on one slice. Top with overlapping potato chips. Close sandwich and enjoy! Makes 1. Plane Jane: Spread mayo on white bread and top with potato chips. Banana Crunch: Spread peanut butter on white bread. Add sliced bananas, and top with potato chips. Cheese ‘n’ Chips: Make a grilled cheese sandwich with American cheese and potato chips on buttered white bread. This salty sandwich may be the best midnight snack of all time.